Welcome back to The Holiday Home Series at The Yellow Cape Cod. There are no rules when it comes to holiday decorating. It's all about your traditions and what gives your family the warm and fuzzies. With that being said, sometimes the warm and fuzzies come from the beautiful, professionally decorated trees at Macys. Being a third generation Holiday Decorator, my Mother and Grandmother have taught me some tricks of the trade. 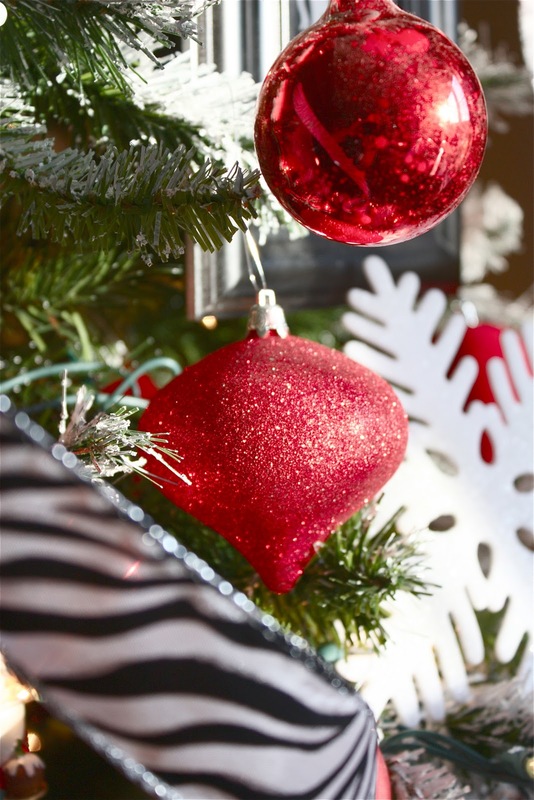 Today, I would like to share a few secrets on how to achieve the look of a professionally decorated tree at home. Beginning with the most basic Christmas tree element, Bulbs. Using lots and lots of bulbs in the same color unifies a tree with an eclectic mix of ornaments. Bulbs in the same color with variations in texture give the tree interest. Shiny, glittery, flocked, matte finished bulbs all look amazing together and keep the tree from looking flat. Weaving your lights over and under each branch, and from the base of the branches to the tips will illuminate the tree from the inside out. It will provide amazing back light for your ornaments and give the tree a twinkling light effect. 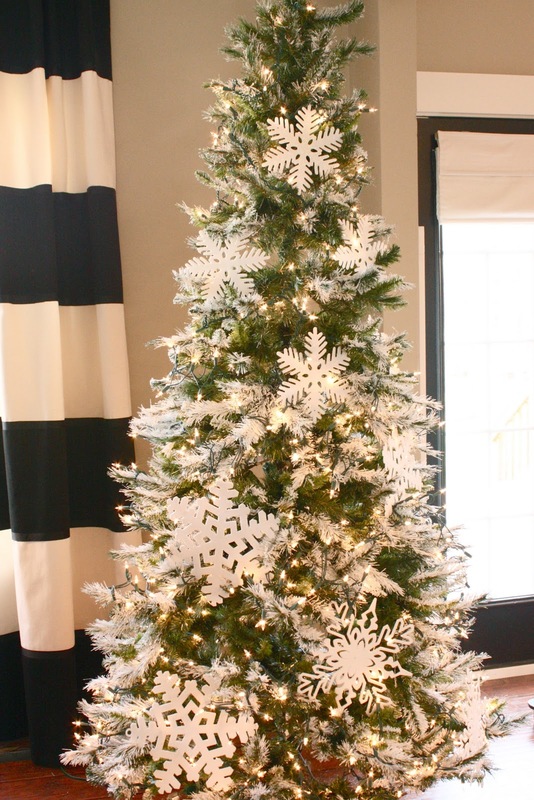 Adding a large graphic design element (like these snowflakes from The Dollar Tree) will draw attention to the tree. It will also help space the other ornaments evenly by creating "compartments". Adding unusual elements to the tree will give it a more "showcased" look. Like the trees you see in the retail stores. I made these monogrammed ornaments with frames from The Dollar Tree and free internet clip art. Take advantage of bare spots or openings in the branches to create little nooks for showcasing ornaments that are special. and large at the bottom. Hanging ornaments deep inside the branches creates depth. Depth is the key ingredient to a professional looking tree. For perfect ribbon curls, let the ribbon fall naturally from the spool. Then loosely hang the ribbon vertically from the top of the tree. The less the ribbon curls are manipulated, the better they look. The last tip I would like to share is very important. If you find yourself getting frustrated, stop. Take a step back and sip a spiked eggnog. Enjoy the process and you will enjoy the result so much more. I am now accepting new online design projects! Love your tree! Love the tip on the ribbon..how many pieces do you have? I love ribbon but I can't seem to get it right! Also, wanted to say thanks for the Holiday series...I'm really lovin' it! How pretty!! I already have lots of the Dollar Tree frames left over from my daughters wedding in July...they were used on the tables at the repection. Thinking I might do a wreath for her and my SIL with a b/w print from their wedding. Oh I wish I'd read this post before I'd put up our tree! I'm not sure I could ever get my tree to look that good but I'm going to try my hardest next year! 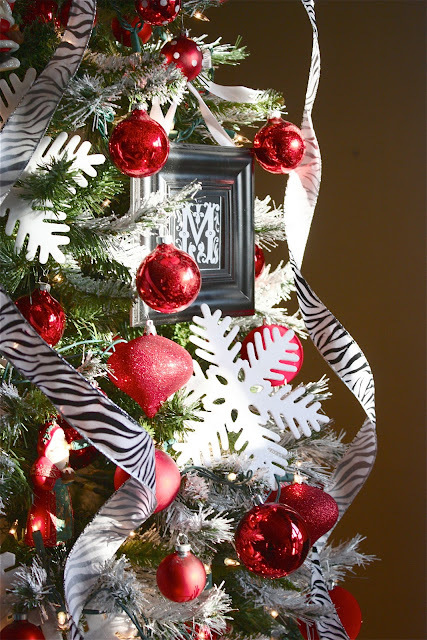 Your tree looks so pretty: love the flocking, the zebra ribbon, the red, white & black palette! This makes me want two trees this year - one for the family, and one just for me! I so love all your post!! You have the best tips and inspiration! LOVE!! I'm getting antsy to put up my own tree now! 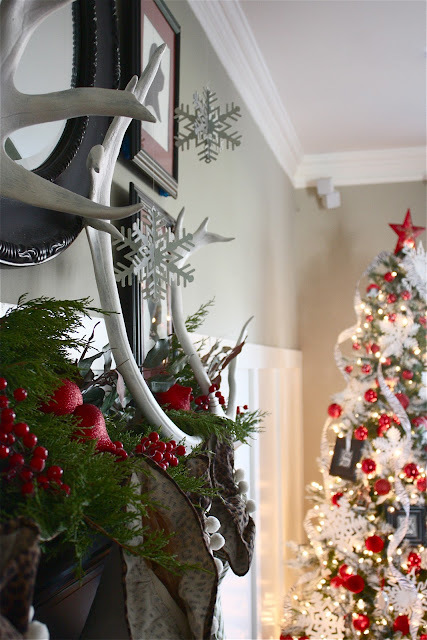 Looks gorgeous, and your home looks so welcoming for holiday guest! What a beautiful tree! Thank you for all the fabulous tips. wow! great post!! this will come in handy this weekend!! Great tips! Love the idea of adding large graphic elements. Amazing. I love it. I always wondered how to get the ornaments to balance. Thank you! So, THAT'S what I was doing wrong ... I totally forgot the last step ... I'm off to get egg nog right now. LOL. I love your tree ... I have the same jumbo snowflakes on mine, as well as on my kitchen soffits ... such great fillers. And, thanks for the great tips, too! I'm in love with your theme. It's exactly what I wanted this year. But is there a whole picture of this beautiful tree? Would love to see it. This tree is gorgeous! Great tips for decorating. I'm trying to find a chart or a formula for how much garland I need to wrap around my 8' tree. Any advice? HI! I have been following your Holiday Home series and Love it!! I was wondering if you have any tips on purchasing a faux tree? We have one that I got discounted from Walmart years ago, and I hate it! I would love to upgrade to a better tree, but I don't know what to look for to make sure it looks pretty, like yours! Great ideas and beautiful trees. I love Christmas and ALL that it represents. We love to decorate in celebration of Christ's birth and start doing so before thanksgiving. Are there any alternatives to a flocked tree? Don't want to go through the hassle or potentially ruining our nice tree. Would that faux snow sprayed on the tips have the same effect? Great tips! I also find that putting reflective or mirrored-style ornaments deep in the tree (near the trunk) helps to reflect the lights and brighten the tree! Use icicle lights pushing them to the center of tree pull each strand to the tip of branch. You can manipulate where each strand go. I'd love to know where you found that red star for the top of your tree. It's beautiful! Beautiful! What is the color black that you use so often? Beautiful! Thanks so much for the tips! Will you share a picture of the full view of the decorated tree once you finished? I am using your Snowflake tree in a Christmas Tree round-up I am doing on Monday... it is simple and darling and fun! Full credit is given to you with a link back here! Have a great Thanksgiving! I super love the small black picture frames as elegant Christmas Tree Ornament. :) I am a sucker for art, elegance, and timelessness. And I think this idea greatly fits to that category! Thanks for sharing.